Frank Meyer, a plant explorer from the U.S. Department of Agriculture, brought the first Meyer lemons (Citrus x meyeri) to the United States in 1908. The original Meyer lemon trees carried a dangerous citrus virus called tristeza, but the "Improved" version (Citrus limon "Meyer Improved") is tristeza virus-free. These orange-lemon hybrids produce yellowish-orange fruits that resemble oranges in color and shape, with fruit that is less acidic than that of lemons. They thrive in U.S. Department of Agriculture plant hardiness zones 9 to 11, but many growers cultivate Meyer lemon trees indoors as houseplants. They are susceptible to a number of fungal, viral and bacterial infections. Lemons growing from a branch at a farm. Greasy spot fungal spores germinate on the lower leaf surfaces and create blisters in the spots where they attack the leaf tissue. On the upper leaf surface, yellow spots turn into greasy-looking, raised dark brown blisters. The leaves die and fall from the tree, which increases the tree's chances of being damaged by cold or attacked by other pests or diseases. 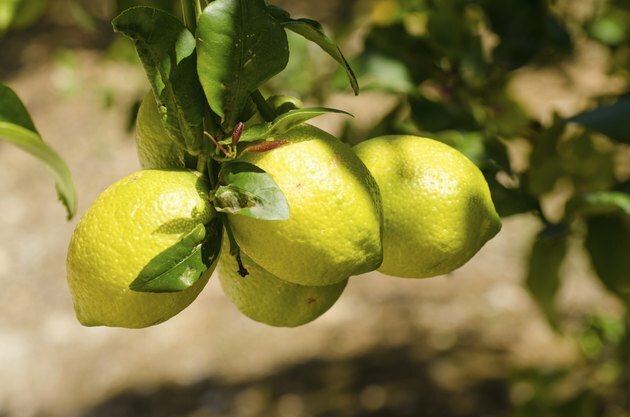 Mix 2 to 4 teaspoons of copper fungicide into each gallon of water and spray infected Meyer lemon trees, taking care to thoroughly cover the undersides of the leaves. Manufacturer's suggested measurements may differ; always follow label directions. Spray as soon as the first symptoms appear and repeat the process every week to two weeks. Rounded, scabby lesions appear on Meyer lemon shoots, leaves and fruit. The lesions begin as pinkish pustules, but change from pink to brown and eventually turn dark gray. Severely infected fruit can become deformed. Treat diseased trees with three applications of copper fungicide, mixing about 2 to 4 teaspoons into each gallon of water, or per label directions. Apply the first spray when the first spring leaves appear, the second when the flower petals fall from the tree, and apply the last spray about three weeks later. Canker is a bacterial infection that causes twig dieback, leaf loss, severe blemishes on fruit, early fruit drop and a general decline in tree health. The earliest symptoms are raised blisters on the foliage. The blisters become raised and corky in texture and turn brown, with watery, yellow edges. Similar lesions appear on both the fruit and twigs. Trees are most likely to become infected during the first three months after their blossoms fall. Spray Meyer lemons with a copper fungicide during this time. You may need to spray two or three times depending on rainfall. It is important that the fruit remains coated with fungicide while it is vulnerable. The Phytophthora fungus that causes gummosis is most active when the weather is cool and rainy. The first noticeable symptom is sap that appears between cracks in the bark. The bark begins to crack and eventually peels off, creating lesions that will eventually encircle the tree. Unable to get nutrients from the roots, the tree eventually goes into decline. You can treat the disease by mixing between 2.5 and 5 pounds of the granular fungicide fosetyl-al with 5 gallons of water, or according to label directions, and spraying or painting the infected tree trunk. Thoroughly cover all lesions. Apply as often as four times a year. Avoid getting fosetyl-al in your eyes, on your skin or on your clothing. Wear gloves and safety goggles. Rinse your gloves before removing them. The Colletotrichum gloeosporioides fungus attacks Meyer lemon tree twigs. The resulting disease, anthracnose, is most likely to occur during wet, rainy spring weather. The twigs die, and dark stains appear on the fruits, and the leaves die and fall from the plant. Masses of dark fungal spores appear on the dead and dying foliage. This disease is usually not dangerous enough to require fungicides. Meyer lemon trees are also susceptible to root rot. Root rot does not respond to fungicides. Ensure the soil has adequate drainage, and do not overwater. Insects such as whiteflies, aphids and mealybugs drain plant juices from Meyer lemons and excrete a sweet, sticky liquid called honeydew. The honeydew acts as a growing medium for sooty mold, an unsightly black fungus. Plants can usually tolerate sooty mold in light amounts. Spray trees early in the day with a steady and forceful stream of water to dislodge the insects. Stephany Elsworth holds a Bachelor of Fine Arts in fine arts/curriculum and instruction from Texas State University and a Master of Education in reading education from Grand Canyon University. She enjoys gardening, arts and crafts and spending time with family.